Note: On September 27, 2014 Richmond, B.C. tourism officials will open an one-hectare, one million dollar playground based on the area's agricultural history. The playground is located in Terra Nova Park in the northwest corner of Lulu Island, on the site of a former farm house and stables. 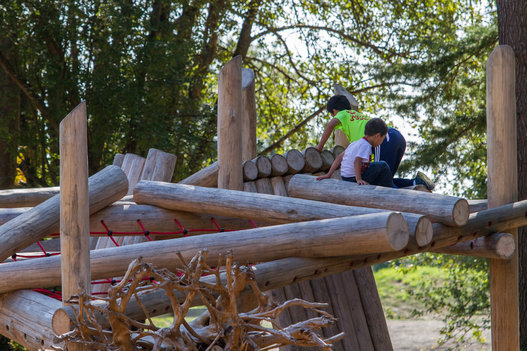 The playground includes a farm inspired water and sand play area, and a "log-jam" - a climbable timber structure that mimics walking on beach logs. There is also tandem 35-meter-long ziplines, a tree house and aerial rope walkway. The new playground is being billed as a tourist attraction. FYI - this is Richmond's second million dollar playground, the first was Garden City Community Park, built in 2008. Kids climbing on the log jam structure. In the 21st century slides and climbing structures take on a whole new dimension. Over the past decade in Calgary (and I expect in many cities around the world), children’s playgrounds have become more and more colourful, creative, sculptural and elaborate. No longer do a few simple swings, metal slide, teeter-totter and “rocking” duck or horse sufficient for the 21st century playground. I am told by my friends at Ground3 Landscape Architecture that $100,000 would get you a reasonably sized playground and $30,000 get you one small combined play piece. Since 2010, the Parks Foundation Calgary through the Playgrounds and Communities Grant Program has funded over 100 new playgrounds in Calgary valued at $15 million - many in low income communities. While Calgary may not have bragging rights a having one of the top ten playgrounds in the world, our children are blessed with over 1250 playgrounds in parks and schoolyards across the city – that’s about six playgrounds per community. Nobody is more than a few blocks from a playground in this city. Perhaps Calgary’s moniker should be The City of Playgrounds. One of my favourite mid-century modern playgrounds is located in Lakeview. It is interesting in that it is only accessible by walking along a tree-lined pathway from Linden Dr. SW, as there are no streets directly adjacent to the pocket park and its playground. It truly is a hidden gem. Some of the original playground equipment is still in use and I hope the community will recognize its uniqueness and keep the retro equipment. Lakeview's hidden playground with simple retro playground equipment - rocking horse and small metal slide. Parkdale's Helicopter Park is one of Calgary's most popular playgrounds. The park is looked just below Foothill's hospital and its heliport, hence the park's name as helicopters flying over area a common sight. I am not sure if it is true, but it seems, as private backyards get smaller, (today’s housing lots are smaller due to infilling in the inner city and mandated smaller lots in new suburbs) there are fewer large backyard swing sets that were poplar in the ‘50s and ‘60s. Or perhaps trampolines, hot tubs and the mega deck with their outdoor kitchens have replaced them. As result: community playgrounds are becoming more important for young families and those caregivers, grandparents etc., looking after children. Personally, I think this is great. It means more community socializing which in turn, helps create stronger neighbourhood ties. I remember one spring day after school; we took the seven-year-old twins next door to the playground across out street. Soon, several other families joined us and before long, we had a community soccer game happening with 4 parents and 8 kids. Gotta love an impromptu community soccer game. Given the recent controversy over public art in Calgary and most other cities (too often, public art is difficult for the public to appreciate, or is simply just not that good), I can’t help but wonder if maybe we should be focusing on commissioning artists to design playground equipment that would be fun and inventive. Imagine if every playground was a mini artpark. Imagine a scaled down Wonderland (big white head sculpture at the Bow office tower) in the middle of a park where children, teens and adults could climb on it. There is something innate about human wanting to climb things. Once when I was at the Bow, I saw an office worker climbing Wonderland in his suite and dress shoes (actually he took off his jacket) - he had no problem getting to the top. Unfortunately, the Bow now has security to chase away would be climbers. It is interesting too how the two mega public art works in Chicago’s Millennium - Park Cloud Gate and Crown Fountain - have become as much playgrounds as public art. Could we also encourage landscape architects to be more creative in their design of parks and public spaces? Whenever walking Rossi (our friends’ dog) at River Park, I am always impressed by the “cluster planting” of trees that capitalizes on the subtle synergy of their sculptural shapes as well as the strategic placement of benches to capture vistas of the park, river and downtown skyline. There is an aesthetic quality to the design of the River Park that is very similar to art. Calgary office workers just can't resist climbing Wonderland. You can take the child out of the playground, but you can't take the play out of the man! Jaume Plensa's Crown Fountain in Chicago's Millennium Park is a playground for locals and tourist of all ages. Cloud Gate, also in Chicago's Millennium Park is a magnet for people to look and play with it. This well-treed playground in Chicago'sGold Coast community attracted dozens of families mid-week, mid-day in April. Calgary's Beltline community is one of Canada's most dense communities. It boast this very popular playground in Haultain Park. Downtown Calgary is very family friendly. New playgrounds have lots of fun colourful climbing equipment that has many parallels with modern art. The mono-chromatic blue playground in Tuxedo also has many links to art - line, colour, shape and composition. Perhaps the best playground I have ever seen was in Container Park in Las Vegas. In the middle of a new urban development made of railway containers was a fun children’s playground the size of half a football field. At one end was a computerized piece of playground equipment that could be programmed so people of all ages could play games of their choice. At the other end was a three-storey tree house that was fun to climb. In between were other interactive play areas – no swings, no slides and no teeter-totter here. Surrounding the playground were outdoor patios where people could sit and watch – providing some of the best people watching I have ever done. The new “digital” playground components have great appeal especially to adolescents and adding a new dimension to playgrounds. The newest trend in playground equipment is computerized games that are attractive to younger children and parents during the day and my young adults at night. While these lounge chairs have been removed from East Village's Riverwalk, they would make for a good addition to another neighbourhood park as kids would love to climb over and under them and adolescents and adults would use them to lounge and chat. They also have a wonderful sculptural quality to them. This Henry Moore sculpture in front of the Art Gallery of Ontario becomes a fun place for older children and adolescents to hang out and chat. Parque Gulliver in Valencia Spain is Cristal McLean's (principal at Ground3 Landscape Architects) favourite playground. Located in the old channel of the Turia River, the playground is based on the story of Gulliver's Travels by Jonathan Swift. As per the story, a giant wanders into town and scares the tine Lilliputian people so they tied him to the ground while sleeping. Today it is the children who are the Lilliputian people who can climb all over the giant. trying to get to know him. The sleeves become caves to explore, the legs are stairs to climb and the hair is a slide. And its free! First built in 1990, it was completely refurbished in 2012 and continues to be one of Valencia's biggest tourist attractions. Every part of the giant is available to climb on and slide down. Giant ant is both public art and a playground. The more I think about it, the more it makes sense to me that we should be hybridizing public art and playgrounds to create public spaces that are more interactive. We should think long and hard before we ever commission a static public artwork again. Similarly, I would love to see landscape architects be given freer reign to exercise their creativity in designing our parks and plazas. Perhaps Calgary should change its current “1% of capital project costs for public art” policy to “1% of capital project costs for public space enhancement” to allow us to better create unique and active public spaces that more citizens can embrace at some level year-round for years to come.